Original color photographic print, July 24, 1969: Leonard Pugh Collection. Fish, Bob. "Apollo 11 & 12 Recovery." Aircraft Carrier USS Hornet Museum. 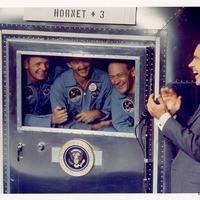 Accessed July 16, 2015. http://www.uss-hornet.org/history/apollo/. 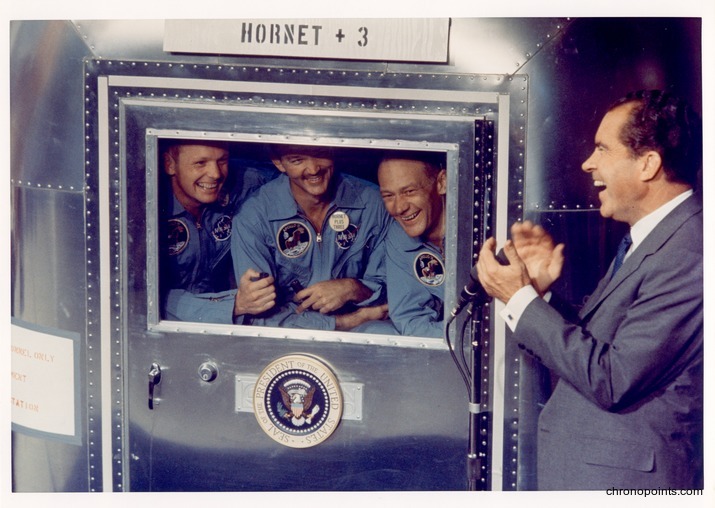 “Quarantined Apollo 11 Crew with President Richard Nixon Aboard the USS Hornet.” RICHES of Central Florida accessed April 22, 2019, https://richesmi.cah.ucf.edu/omeka/items/show/6046.